I had them nested with the one on the right sitting inside the one on the left. Mija, in an attempt to get into the one on the left because there was about a 6 x 8 inch gap and we all know cats have to see what's inside a box, knocked them onto the floor. I'm tempted to just leave it this way, although I'll have to move it to another spot in the living room. 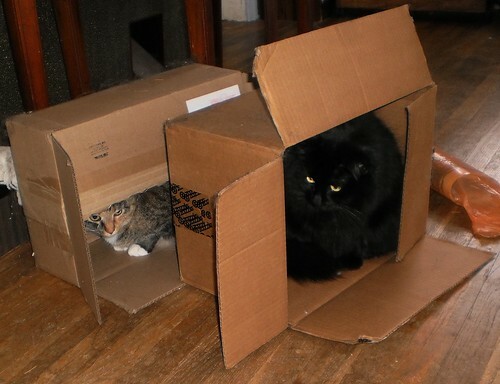 I'm thinking the caption is, "Mija and Pilchard investigate apartment living in a move to cut living expenses."